I had such a long day, but I managed to cook 5 dishes...all with donabe! Brown rice was made with double-lid donabe rice cooker, Kamado-san. Daikon miso soup was made with soup & stew donabe, Miso-shiru Nabe. And, the rest of the dishes were all made with my new donabe steam-roaster, Tochinsai in microwave! (I was so tired that night so I didn't take any picture of the process, but...) with Tochinsai, I could make 3 delicious dishes in less than 30 minutes...seriously! 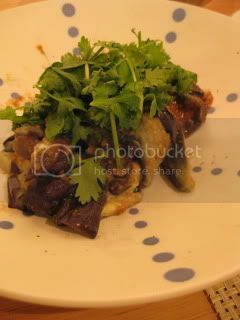 Steamed eggplant in miso-sesame sauce. Eggplant was cut in half set in Tochinsai (with the grate - white-side up) and microwaved for 5 minutes. Then, I further sliced the eggplants and just tossed in the sauce. 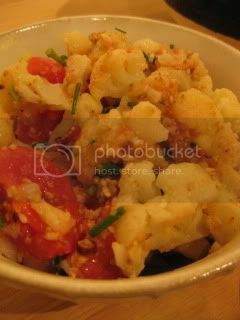 Cauliflower and tomato salad. Cauliflower florets were steam-roasted in Tochinsai in microwave for about 5 minutes. Then they were tossed with tomatoes in shio-koji vinaigrette I quickly made. 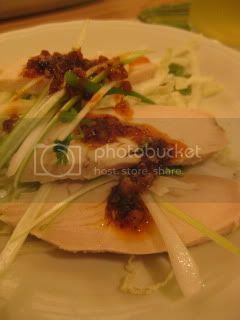 Steam-roasted shio-koji marinated chicken breast with chunky la-yu. A large piece of chicken breast was simply marinated in shio-koji for an hour then set in Tochinsai (with the grate - black-side up) and microwaved for about 6 minutes. It was sliced and served with my homemade chunky la-yu. 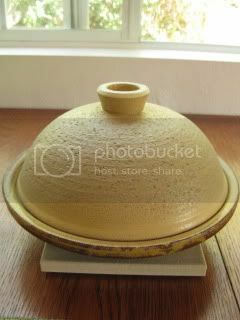 Tochinsai is a fantastic time savor donabe. And, the best of all, it cooks each ingredient very nicely. The chicken was so juicy and tender.